upper day of the ox in February (and again in November before the Niiname Sai festival 新嘗祭（にいなめさい）). The Day of the Spring Festival in February. Two shrine priests 神部二人 the imperial gardens make a fire (niwabi 庭火) and purify the ground with special rites and plant a sakaki branch. A divine horse is paraded in the grounds and later kagura dance and music is performed. "Food for the Gods" 神饌（しんせん shinsen） are offered on the altar.
. . . CLICK here for Photos of shinsen ! Kara no kami siginfies that he came from Korea. He was a protector deity of the Imperial ground. There are many legends around this deity from Korea, a 渡来神. He appears in the "Chronicle" under the name of I-so-takeru 五十猛神（いそたける)("Fifty-fold-Valiant"), of whom it is related that he was taken over to Korea by his father Susa-no-oo (the "Impetuous-Male"
It was customary to offer horses or bulls to this god during rain rituals (Karakami shinkoo 韓神信仰) since the 5th century. The practise to offer "sacred horses" seems to have come from Korea. Near some shrines in his honor there have been finds of bones from horses and bulls. Emperor Kanmu Tenno offered bulls 桓武天皇の牛殺し. ushi no ikenie 牛の生贄. This SonoKara festival in the honor of the two gods has been held in Kyoto before it became the capital, to ward off epidemics and disease. First it is performed in the southern shrine for Sonokami 南の園神社（そのかみのやしろ）, then in the northern shrine for Karakami 北の韓神社（からかみのやしろ）. But this ritual has not been performed since the Kamakura period. Today the shrine Nue Jinja 鵺神社 is in their place. In the precincts is the famous pond Nue-Ike 鵺池, which has dried out. NUE is written with the characters for night and bird. Once at night at the end of the Heian period, a strange wailing voice like that of a golden mountain thrush (toratsugumi とらつぐみ【虎鶇】) was heared in the precincts. The emperor, who heared this voice, became ill. To cure him, Minamoto no Yorimasa みなもとのよりまさ【源頼政】 shot an arrow with the tail feathers of a pheasant into the four corners of the night. 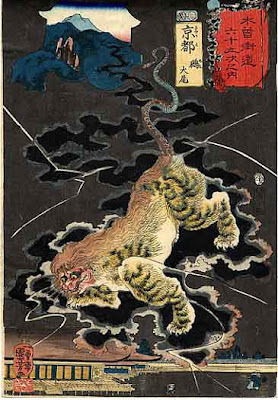 The beast was hit and fell down, to the place where now we have Shrine Nue.
. Yorimasa Minamoto killed a monster Nue . - - - - - More legends about the NUE. Usually considered an alternate name for the kami Ōkuninushi, although works like Izumo fudoki and Izumo no kuni no miyatsuko kan'yogoto describe Ōnamuchi as a "land-forming kami." As a result, it appears likely that Ōnamuchi was originally an indigenous land-creating kami of the Izumo region which was later adapted to the mythology of Kojiki and Nihongi. The main text of Nihongi is alone in describing Ōnamuchi as the child of Susanoo, while Kojiki and an "alternate writing" transmitted by Nihongi state that he was Susanoo's sixth-generation descendant. Descriptions of Ōnamuchi in the fudoki represent him as having the strong characteristics of an agricultural deity. Also, another "alternate writing" in Nihongi relates that at the time of the "transfer of the land" (kuniyuzuri) preceding the Descent of the Heavenly Grandchild (tenson kōrin), the deity Takamimusuhi vowed to construct a palace for Ōnamuchi, and appointed Amenohohi to carry out rites in his honor. As a result, the Izumo kokusō (local governors of Izumo) were considered descendants of Amenohohi. ***** . The Hata Clan 秦氏　Hata Uji .